Mention metabolism, and most people think about burning calories, but that's not all it's about. Metabolism includes everything that happens inside your body to keep you healthy and alive. Sometimes metabolism means breaking things down -- like digesting the protein you eat -- and other times, it's all about building things, which is what happens when amino acids are used to synthesize new protein. Each protein consists of as many as 2,000 amino acids connected by chemical links called peptide bonds. Whole proteins are too large to be absorbed into the bloodstream, so during digestion they're metabolized -- or broken down -- into single amino acids and small pieces with only a few amino acids. This part of protein metabolism depends on stomach acid to flatten out the protein, plus several enzymes that split protein into amino acids. Unless you're consuming massive amounts of calories, you don't need to worry about your rate of protein metabolism. Your digestive tract can absorb up to 10 grams of amino acids per hour, so you'll absorb all the protein in a reasonably sized meal in the hours after you eat. In the end, the body has plenty of time to absorb more than 90 percent of the protein you ate. Protein turnover takes place constantly throughout the body, with new protein being synthesized and existing protein being broken down. Some proteins naturally have a short life because they break down in the process of doing their job, while others stay intact for a long time because they provide strength and structure. For example, the protein collagen builds cartilage and bone. Over time, proteins can be damaged from overuse and free radicals. When this happens, the damaged protein breaks down, and its amino acids go back to the bloodstream. Amino acids circulating in the bloodstream are used primarily to build new proteins. Protein synthesis takes place inside each cell. Special molecules collect amino acids from the bloodstream, take them back to the cell, then assemble them in the particular order needed to produce the protein. If you eat a balanced diet, you'll have all the amino acids required for protein synthesis from your food. If you aren't eating enough, though, your body might start breaking down muscle tissue as a source of amino acids. When you don't consume enough carbohydrate and fat, amino acids can be converted into glucose and used for energy. On the flipside, if the protein you consume contributes excess calories, the amino acids can be stored as fat. Amino acids also fill other essential roles. Tryptophan produces serotonin, a brain chemical that regulates your moods and sleep cycle. Other amino acids help maintain healthy nerves and support the metabolism of DNA. One particular amino acid -- arginine -- is especially important for the health of your heart and blood vessels because it's used to produce nitric oxide. Nitric oxide relaxes blood vessels, which lowers blood pressure, and it also helps regulate heart contractions. It's so important that when you don't have enough nitric oxide, you become more susceptible to heart failure, diabetes and high blood pressure, according to a report in Cardiovascular Research in 2008. To properly support protein metabolism, women need to consume 46 grams of protein daily, and men should get 56 grams, recommends the Institute of Medicine. As long as you get enough protein every day from eating a variety of foods, you'll have all the essential amino acids necessary to synthesize new proteins. On a vegetarian or vegan diet, just eat enough lysine-rich foods -- that's the amino acid these diets often lack, notes Vegan Health. 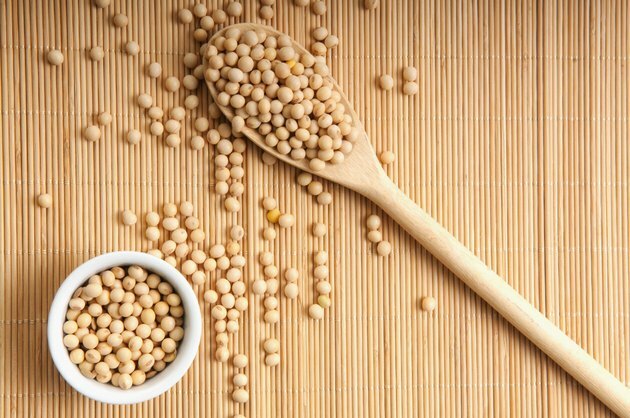 The best sources of lysine are soybeans, tofu, lentils and beans. Another step you can take to optimize protein metabolism -- especially if you want to use protein to build muscles -- is to spread protein consumption out over the day. You should get about the same amount at each meal rather than eating more protein at dinner, concluded the authors of an article in the Journal of Nutrition in June 2014. Their study only included a small number of people, however, so the results need to be verified with more research. Lean meat, poultry and fish have more protein per serving than other food sources, but soybeans and beans aren't far behind. One-half cup of soybeans has about 14 grams of protein, and the same portion of beans has 7 to 10 grams. How Quickly Does Protein Metabolize?